German renewable energy lobby organization AEE has published another meta-study, this time reviewing the wide range of scientific investigations into power storage. As Craig Morris explains, the main finding is in line with other recent publications – storing excess renewable electricity from the summer for the winter will not be necessary for a while. Back in October, we covered the AEE’s previous meta-study on the cost of renewables compared to conventional power sources. A meta-study does not conduct original research, but rather reviews and compares previously published studies. This time, the focus is on the power storage (website in German). In line with previous investigations, such as the one by Fraunhofer ISE, the AEE finds that storage across weeks at a time will “not become relevant until renewables make up at least 60 to 80 percent of power consumption.” In contrast, short-term storage (for hours or a day or two) will be needed sooner, but it will partly also pertain to stabilizing the grid. In 2013, Germany only had 7.5 gigawatts of pumped-storage, including the Vianden facility in Luxembourg, which is connected to the German grid. Their total storage volume is around 40 gigawatt-hours, far less than 0.01 percent of annual power consumption. While some studies had that amount doubling, it will remain insignificant. 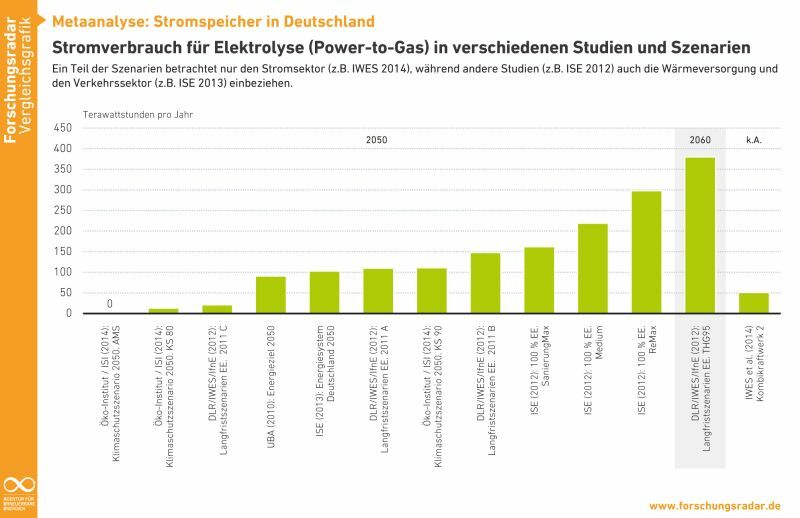 Likewise, the potential of compressed-air storage in Germany was generally considered quite limited, partly because of price, aside from a 2011 study by the German Advisory Council on the Environment, which found this option to be more promising than power-to-gas. 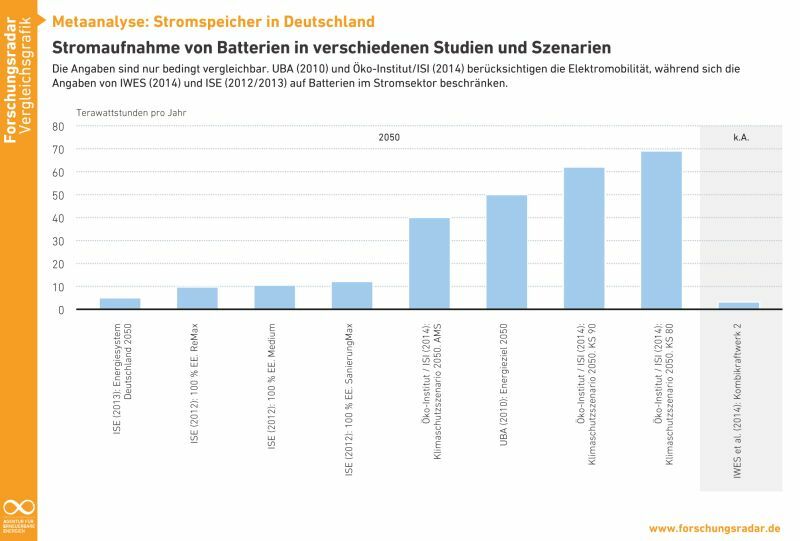 Estimates of battery storage varied widely, partly because some studies did not view electric mobility primarily as serving the need for storage in the power sector, but rather as a way of replacing oil in the transport sector. And indeed, a recent field study revealed that electric mobility could actually increase demand for peak power if people come home from work and applied their cars in for charging at around 7 PM, which is already a time of peak demand with low to non-existent solar power generation (story in German). In other words, if we do not provide the right incentives, people might start charging their electric cars at the very time when there is the least need for power storage. Electric mobility will only act as a buffer for the power sector if vehicles charge when there is excess power. At high levels of solar penetration, excess electricity will regularly be available at noon – when people are at work, not at home. P2G is more controversial. Roughly half of the electricity is lost in the process, and the technology required for electrolysis will not be cheap. But the gas can be used for numerous purposes in all three energy sectors (transport, heat, and electricity) and can be stored seasonally. Below, we see that most studies have at least 100 terawatt-hours of electricity going into P2G by mid-century, equivalent to just over a sixth of power consumption today. The added value of this meta-study becomes clearer when we focus on the Kombikraftwerk 2 study all the way to the right. I was critical of its large share of P2G in my recent review, but clearly the study is quite modest relative to some of the other scenarios. Storage will clearly be a challenge, but the good news is that we still have time. Other options, such as demand management and early retirement of inflexible generation capacity, will help give us more time. It cannot be stressed enough – the amount of power that needs to be stored stems not from the share of renewables alone, but rather from the combination of inflexible baseload power and fluctuating wind plus solar.